Ice is such an easy ice sensory activity but is often overlooked. 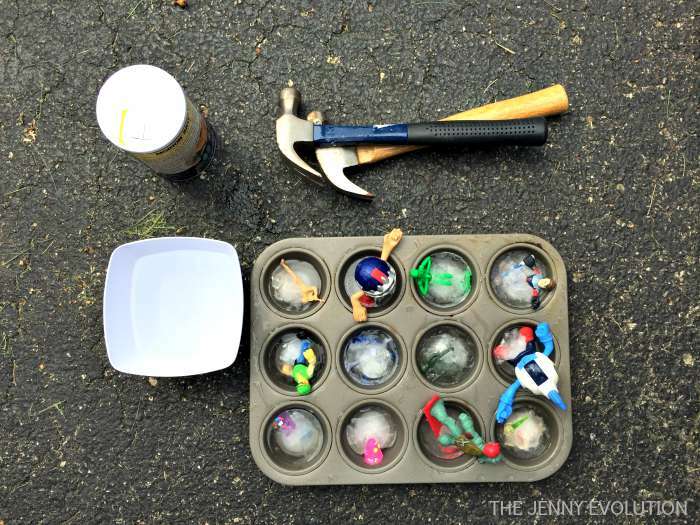 While there are lots of sensory things you can do with ice, this Ice Smash activity will be loads of fun and get some energy out. My younger son, Hbomb, is obsessed with ice. Every time he gets a glass of water, he wants ice. Every time I finish a drink, he wants to eat the ice. Some days, he’ll just ask for a glass of ice to munch on. 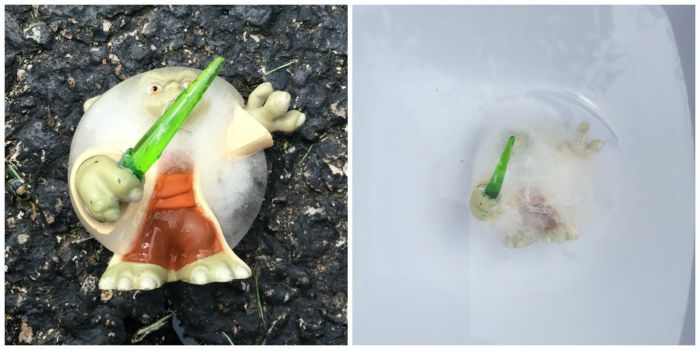 Then the other day, I discovered some of his plastic glasses, filled with water with a Hot Wheels car dropped inside, sitting in the freezer. Yeah… I think it’s time to have some fun with ice! 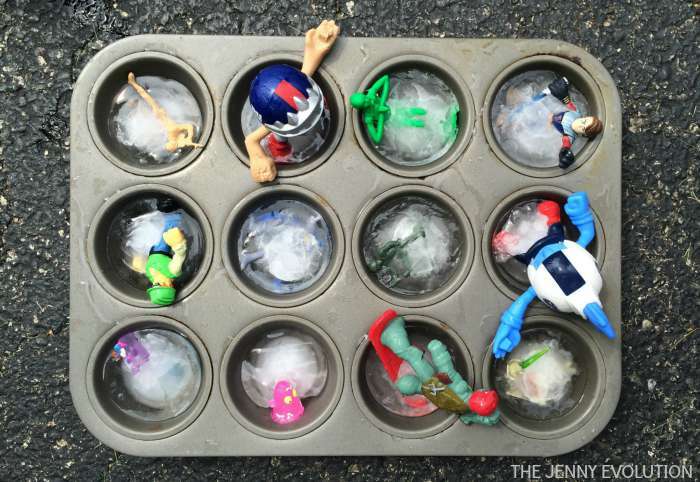 For this activity, you’ll need to fill up a muffin tin with water and drop in a plastic action figure into each spot the night before. In the morning, the ice will be completely formed. I initially made the mistake thinking the ice would be set in a couple of hours… but while the outside was set, the inside was still liquid. Once the tin is set, let it sit out on the counter for 10-15 minutes so you can easily pop the ice cubes out. My boys couldn’t wait to get their hands on these and insisted on getting them out themselves. To contain the mess, we did this out on our driveway. 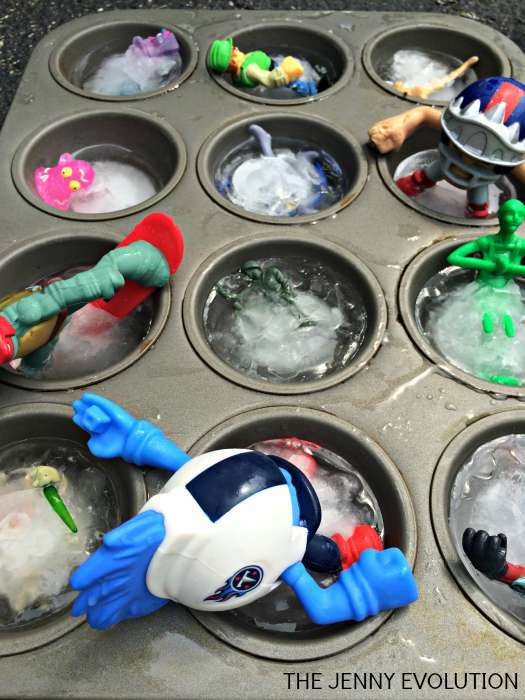 With supervision, I allowed my kids to start figuring out the best way to get the figures out of the ice. Should they tap it on the bottom. Should they smash from the top? Talk about working out their proprioceptive system. It allowed them to work on how hard they hit the object as well as familiarize themselves with controlling something as heavy as a hammer. Think about it… a hammer with a wood-hammer has some serious weight for a kiddo. We also wanted to see how quickly salt would melt the ice and talked about how we put salt on the sidewalks when they freeze over with ice in the winter. Then we talked about how we can put ice in a cold glass of water and the ice doesn’t melt right away. What would happen if we put the ice in hot water? 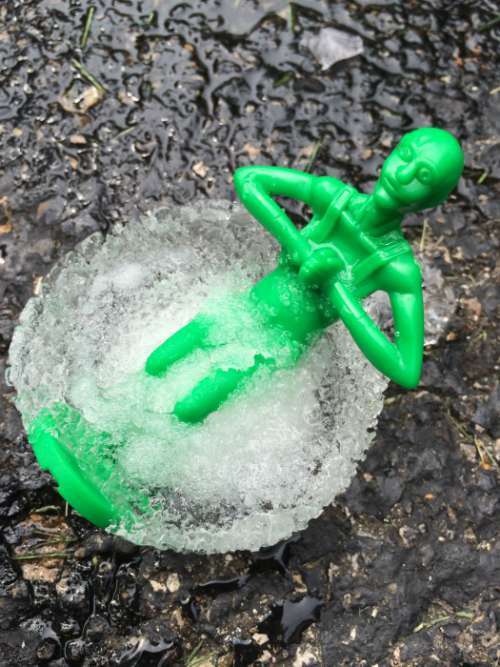 Sure enough, the ice did it’s job, melting away quickly while helping to cool the warm water. Love this! We give the boys tin cans to smash with hammers, but “freeing” one of their toys would be so much more fun! Plus, the salt and heat experiments!